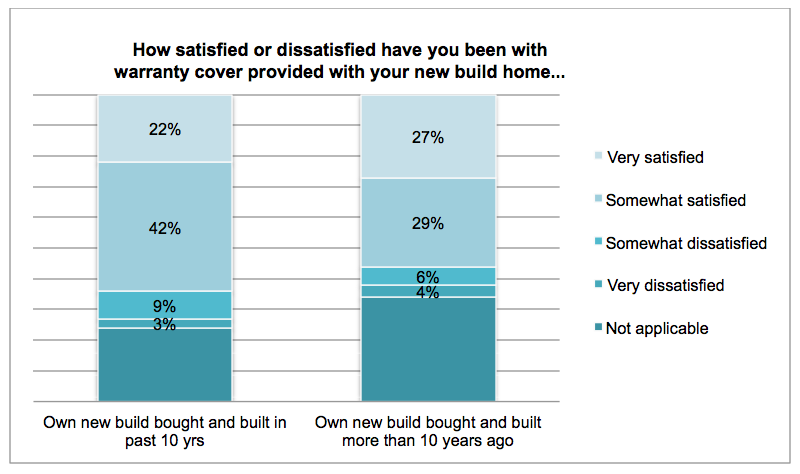 New homes are often marketed by developers with the promise of lengthy warranties offering peace of mind. 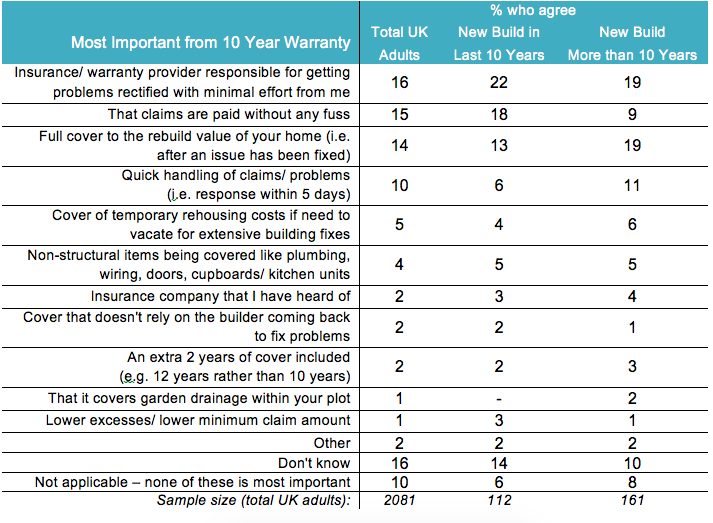 Indeed, 58% of people who have bought these types of home in the last 10 years think that the warranty was an advantage over an older property. But home buyers opting for new build properties are being left exposed by warranties that fall short of their needs and expectations. 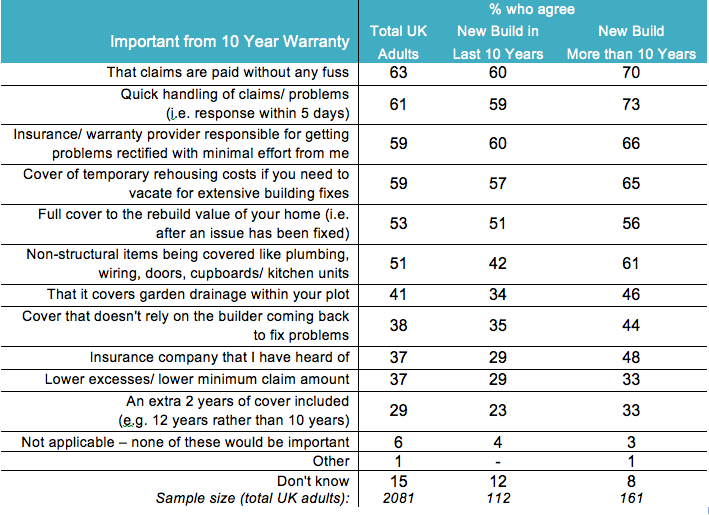 The survey findings further reinforce conclusions from the All Party Parliamentary Group (APPG) report ‘More homes, fewer complaints’, which stated that consumers think a warranty is a hallmark of absolute quality. 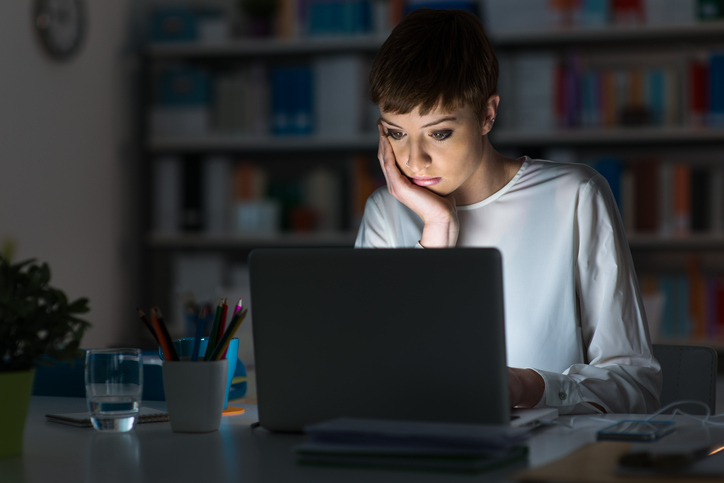 Often warranties cover far less than consumers assume, in responding to the 2017 Homeowner Survey, comments such as “Covered so little it was virtually worthless” and “The cover was minimal and far below expectations” were typical responses to the survey. 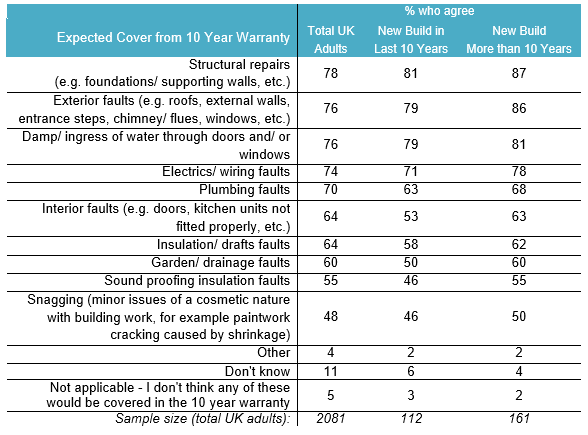 Amongst consumers who have bought new build properties in the past ten years, the most common misperceptions around the types of faults which aren’t covered by the full 10 year warranty are electrical and wiring faults (71%), plumbing faults (63%), insulation and draft faults (58%). Nor do many consumers appreciate that for the first two years after completion, it is down to the builder to sort out defects and after that the warranties cover matters that affect the structure of the home. Again, comments such as, “NHBC said everything I asked about wasn’t their problem” and “Builder very reluctant to snag and nothing seemed to be covered by NHBC warranty” were typical. Consumers also complain that where a problem was covered by the warranty, the provider was reticent to step in and help resolve disputes with the builder. 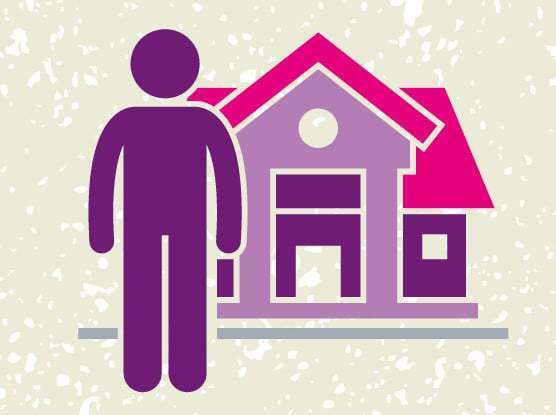 The main providers of new build warranties include NHBC, LABC and PremierGuarantee. The NHBC, which provides warranties for approximately 80% of new homes in the UK, has asked the Competition & Markets Authority (CMA) to reconsider some of the rules that bind it (imposed in 1995) now that there is more competition from other providers and more choice for house builders. In addition, the housebuilding industry has come under mounting pressure to raise quality standards from the aforementioned APPG report into the quality and workmanship of new housing in England. 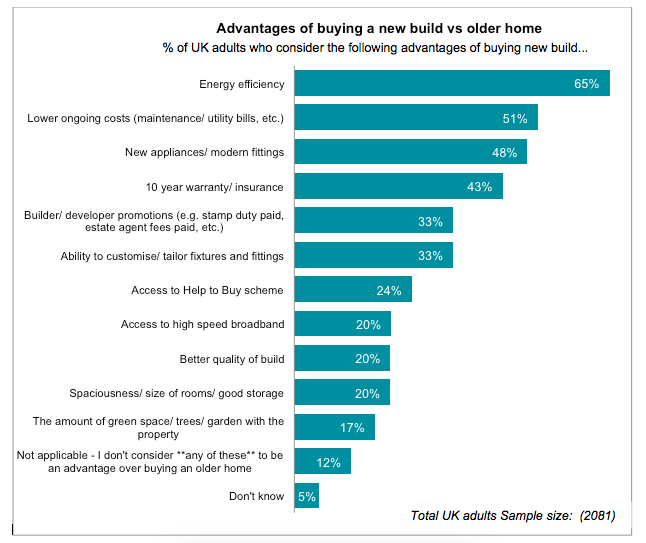 The problems caused by high expectations around warranties are unlikely to help new build homes become more popular. 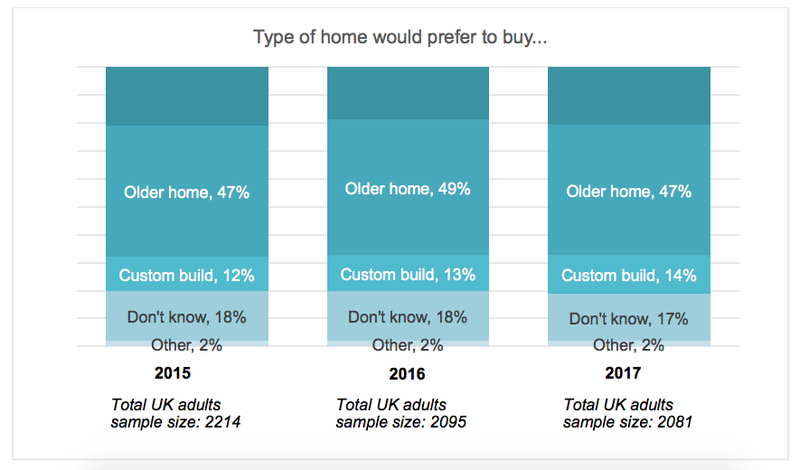 This is a real issue, with twice as many UK consumers (47%) saying that they would prefer an older home that’s more than 10 years old, to a new build home (21%). I agree entirely with this. NHBC guarantees are not worth the paper they are written on. We purchased a new build four years ago and it had a lengthy snag list, which took well over two years to complete most of it, some still not resolved and NHBC either say we are not covered or say the builder is within their guidelines. One particular point not covered is efficiencies. Our property had an air source heat pump fitted, sold as ultra efficient in terms of performance and running costs. Neither were true, especially the running costs, which at one point were2-3 times the calculated costs according to independent consultants. NHBC said this was not within their remit, despite us having a face to face meeting with NHBC and the builders. They say they will help us resolve the issue through to conclusion, but actually have no weight behind their comments. This is not a small builder (Hill & Co) but they are effectively building unregulated apart from major building issues. Hi there. If you purchased the property less than 2 years ago, you can approach the developer to see if they’ll fix this as part of their developer warranty. 10 year NHBC type warranties covering years 3 to 10 cover more structural defects – walls, stairs, the roof etc. Hello is a new toilet cistern included in my 10 year guarantee? Well as a second owner of a 3 year old David Wilson home I was told issues such as missing roof insulation , dropping baths, etc was not covered as second owner of the house the warranty did not transfer! However from reading this article it appears even if it did I would have got nothing sorted even if it had transferred. Yes there are problems with warranties and your situation is very sad to hear. Please get in touch and tell us more and we can see if we would be able to help. This will ruin me financially, but no-one is bothered. Any suggestions welcomed !